I have tried to fish a variety of venues each day just to see what's what and if there are any signs of fish or feeding birds such as pelicans. We are based just outside of a jolly Harbour marina on the West coast of the island. Most mornings I have fished from the little stone breakwater at Urlings harbour where we had success in the past. Fished about 15 mins before dawn (05:45) and as the dawn period is short here in the tropics I pack in here at around 6:30 as the local fishermen are setting out for the day and the entrance to the harbour is busy. I have had a number if bites on Rapala j11 & 13 but no hook ups. 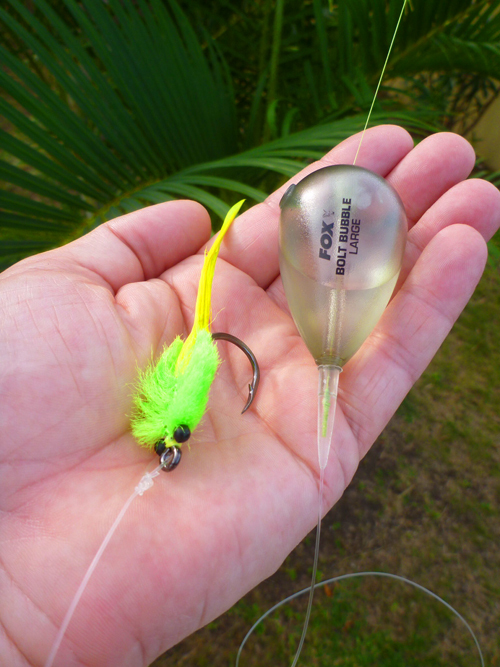 Yesterday my suspicions were confirmed that these bites were from needlefish as I used a tarpon fly behind a FOX carp floater controller and hooked and landed a needlefish of a couple of feet in length. Apart from that I've had a few follows from small snapper which tend to shy off at the last second of the retrieve. The tides have been well up in the early mornings so I've not been out onto the flats on a permit hunt yet. The next week of neaps should offer better conditions. Also, after leaving Urlings each morning, I fished the lagoon which is on the way back to our villa. As you know this holds some good medium-sized tarpon and on previous trips we hooked and lost several but I have not had a sniff or seen any fish moving, rolling or chasing prey fish which is usually quite a common sight. I have tried fishing Ffryes beach and Valley Church Beach without a touch. One bonus is that we have found a group of tarpon to around 40lb inside the marina at Jolly Harbour and have fed them chunks of calamari which we bought in 3lb frozen blocks from the local supermarket. They didn't take long to catch on and took the freebies with great enthusiasm with several fish competing for each chunk of squid thrown in. These fish are grouped up in a neglected part of the marina where the deck boards of the old piers are rotten and/or missing so it's a bit precarious and there are several abandoned boats and an old pedalo hitched up to the crumbling woodwork. Anyway yesterday - Christmas morning - we set of with a 20lb class boat rod to freeline a chunk of squid in among the wreckage. We got the tarpon interested with a few free offerings and then just tossed a bait on a 7/0 circle hook into a gap between an old fishing boat and the pedalo. A massive boil on the surface was the indication that we had a take and the line pulled tight and then the hooked fish pissed off out into the middle of the channel before crashing back into the shelter (snags) of the pier pilings. Seconds later out into the channel again for a few leaps and head shakes and then the hook came out which was not totally unexpected. Lyn had a go next and hooked a fish in similar fashion. It proved a bit of a handful for her so she passed the rod to me and I played it for about a minute before it too threw the hook. 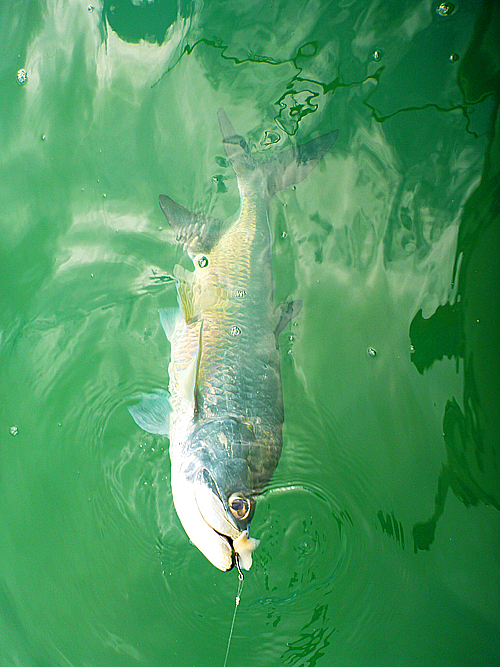 We had two more tarpon which stayed on to be 'leadered' and released by backing the hook out with pliers. I had to scramble down onto one of the old boats which was part submerged in order to get closer to the water to release the fish and the thing nearly sank under the additional weight. I think the size of the biggest fish leadered was approx. 4ft and it led me quite a dance around the limited snag free area that I had to play it in. We've now moved to an apartment inside the marina for the next two weeks. Lyn has already had a snapper and a small grouper from the back decking and I plan on launching the float tube that I brought with me which will allow me to fish around the many piers and decks which back on to all the apartments here. Well it sounds as though they are having a good time doesn't it? I'm quite envious of the tarpon fishing = wonderful fish! Can't wait until he catches those permit or gets towed out to sea in his float tube. I'm leaving on my advert for the book I wrote with Steve - just in case. Even if you don’t buy “The Second Wave” yourself – please tell your facebook, twitter, email, friends about its existence. As I’ve said IT'S AVAILABLE ON PAPER OR FOR YOUR KINDLE FROM - "Veals Mail Order" and from Amazon "Amazon"